Prof Leslie Bank's book entitled "Anchored in Place"
Professor Leslie Bank's book entitled "Anchored in place" is now available. For more details about the book please download link below. Tensions in South African universities have traditionally centred around equity (particularly access and affordability), historical legacies (such as apartheid and colonialism), and the shape and structure of the higher education system. What has not received sufficient attention is the contribution of the university to place-based development. 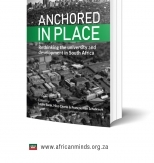 This volume is the first in South Africa to engage seriously with the place-based developmental role of universities. In the international literature and olicy there has been an increasing integration of the university with place-based development, especially in cities. This volume weighs in on the debate by drawing attention to the placebased roles and agency of South African universities in their local towns and cities. It acknowledges that universities were given specific development roles in regions, homelands and towns under apartheid, and comments on why sub-national, place-based development has not been a key theme in post-apartheid, higher education planning. Given the developmental crisis in the country, universities could be expected to play a more constructive and meaningful role in the development of their own precincts, cities and regions. But what should that ole be? Is there evidence that this is already occurring in South Africa, despite the lack of a national policy framework? What plans and programmes are in place, and what is needed to expand the development agency of universities at the local level? Who and what might be involved? Where should the focus lie, and who might benefit most, and why? Is there a need perhaps to approach the challenges of college towns, secondary cities and metropolitan centers differently? May I please receive the free hard copy of the book that is offered.